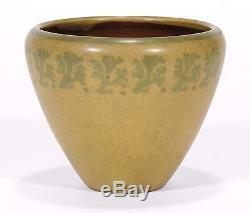 Here is a beautiful Marblehead Pottery decorated vase designed by Hennessey and executed by Tutt with a repeating design of seaweed in green around the rim against a matte speckled sandy yellow ground. The interior is a glossy greenish clear showing through to the red clay. 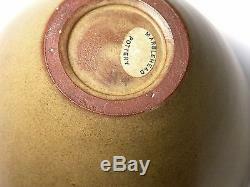 The pottery was founded in Massachusetts by Dr Herbert Hall, run by Arthur Baggs, and dates to about 1915. 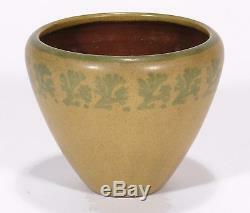 It measures 5 1/4 inches in diameter and 4 1/4 inches high. 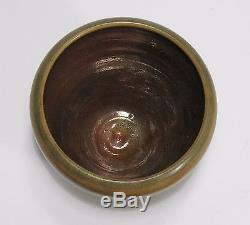 It is in good condition with no chips, repairs, or firing flaws, just a tight 2 hairline at the rim. 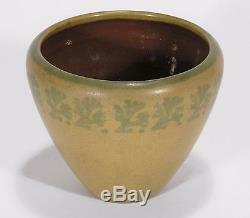 Marked on the bottom with their oval paper label and the initials HT in dark glaze. 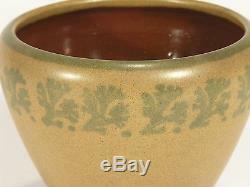 A fine piece of New England Arts & Crafts art pottery. The item "Marblehead Pottery HT seaweed decorated vase Arts & Crafts matte yellow green" is in sale since Friday, March 17, 2017. 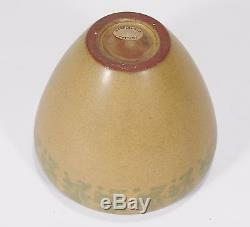 This item is in the category "Pottery & Glass\Pottery & China\Art Pottery\Marblehead". The seller is "jmwpots" and is located in Cambridge, Massachusetts. This item can be shipped to United States, United Kingdom, Denmark, Romania, Slovakia, Bulgaria, Czech republic, Finland, Hungary, Latvia, Lithuania, Malta, Estonia, Australia, Greece, Portugal, Cyprus, Slovenia, Japan, China, Sweden, South Korea, Indonesia, South africa, Thailand, Belgium, France, Hong Kong, Ireland, Netherlands, Poland, Spain, Italy, Germany, Austria, Israel, Mexico, New Zealand, Singapore, Switzerland, Norway, Saudi arabia, Ukraine, United arab emirates, Qatar, Bahrain, Croatia, Malaysia, Brazil, Panama, Jamaica.